The Fusion Maia Da Nang is situated on the pristine beach of Danang, offers Vietnam’s first all-inclusive spa resort for golfers. All spa services are included assuring you of a daily golf massage at no additional cost. Fusion Maia’s design was inspired by that of Forbidden City of Hue. Every villa at Fusion Maia includes a private pool and a private garden. Worried about missing breakfast due to your tee time? Breakfast is served at any time and any place. These are just a few of the steps Fusion Maia takes to make truly special golfing holidays. 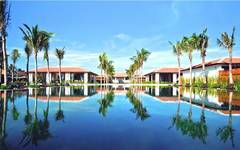 Fusion Maia is only 5 minutes from Montgomerie Links Vietnam and Danang Golf Club and 20 minutes from the world heritage town Hoi An.